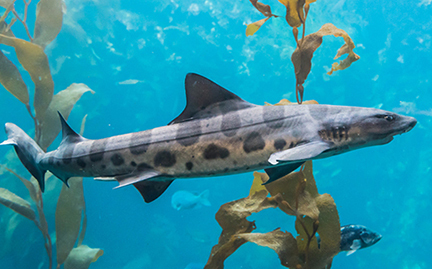 The leopard shark is one of the most common shoreline sharks along the Pacific coast of North America, ranging from Washington to Mexico. Leopard sharks usually live in shallow waters with mouths on the underside of their heads, suited for bottom feeding. Unlike other fish, female leopard sharks keep eggs safe inside their bodies until releasing the baby sharks, called pups.